Jules Verne roman ,,Mathias Sándor - new count of Monte Cristo " write as more his romans, themes gathered especially of day press, weeks and of special journals. Doubtless with selection theme his romans an aim too societys interest. Intrested for politic life of all Europe. His interest was too politic emigrations of Hungary lifes in thet times in France. Napoleon III. and his directory was economic successfuly, therefore self can permit him politicly and finance allowance. With thoose spirit continueted too succesive fransch cabinet. In the time of rules Napoleona III. was in Paris centre interest highest society Pauline princess Metternich von Winneburg-Sandor von Slavnicza, intimates friend wifes of Napoleon III. Princess Pauline, wife of Austria ambassador Robert prince Metternich, was propertys granddaughter very endowmented cancelor of Austria Lothar Klement Metternich. Granddaughter with of nothing behinded to him (too beautys). Instantly after came was in centre interes highest societys of Paris with his visage, knowlidge literature and music talent. Character of the writer\'s Jules Verne romans also reminded Gyorgy Simon Sina. Pauline princess Metternich von Winneburg - Sandor von Szlavnicza have very positive relation to family his fathers, his ancestors and country where come. To effort elevated his cultural and economic standart disinterested concentrated considerable volume finance devices and whit banker Georg Simon Sina invested to spa Trenčianske Teplice. Bigest credit to his developments was of family llésházy. These him and to familys with him with blood conect 251 years. (With family was corporate assets, familys blood volumes and inereses conectid genus Sandor of Szlavnica). Spa was one of moreknowns of Austro-Hunagarian those times. 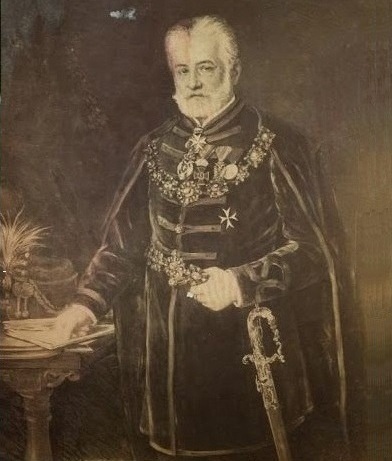 The big development began by the ownership of baron Georg Sina who bought the spa in 1835 in a flourish state (born 20.11.1782 in Niš, as one of the richest men in the monarchy around 1850 he was the strongest rival of the Rothschild family). Trenčianske Teplice was rebuided and modernizated with princess Pauline Metternich Sandor cheansted to european spa centre. His son Simon Sina builted hotel, expanded spa park, his daughter Iphigenia left in the year 1888 port to mirroring Sinay most preserved historical monuments, spa Hammam architektonicly replicating in this time modern oriental moorish style. The Aromanian are not regarded as an ethnic minority in Greece, but are considered "Latin-speaking Greeks" (i.e. Greeks that speak a Romance language). Many illustrious names of Aromanian origin are to be found among the protagonists of the revolution and the outstanding figures in Greek culture and political life. Three examples are Baron George Sina, Marshal Constantin Smolensky, Patriarcha Athenagoras and the Minister of Foreign Affairs Averoff. An important entrepreneurial act was the creation of the First Danube Paroplave Society (Erste Donau-Dampfschiffahrts-Gesselschaft) in 1829, founded by the British - John Andrews and Joseph Pritchard. This DDSG sailing company successfully managed to transport from Galati to the Lower Danube to Solun, Istanbul and Smyrna. She has been supported by influential aristocrats and important bankers. Its shareholders included chancellor Klement Prince Metternich and leading Austrian bank houses. After the lost revolution 1848-49 in Hungary as in France was in emigration his related after his fathers, whoom was count Moric Sandor de Szlavnicza. Only some have been escape befor execution and longtimes aresded. In the Hungary him konfiskated the property, familys was mostly in jail, executed without the grace of all the captives counts. Elite of France with horror observed repression of such magnitude. Knowns, all hungarian nobility is mutually moremal with marrieds conect, that is common property. Blood relative of Princess Pauline Metternich Sandor after her father the count Móric Sandor de Szlavnicza was Baron Imre Ivanka Draskócz et Jordánföld. As captain of cavalry, commander of the 1st National Guard, which consisted mostly of soldiers Novohrad, Hont and Pest county had a substantial share in the victory over Croatian ban Feldmarchall-Lieutenant Josip count Jelačič of Bužim September 29, 1848 in the Battle of Pákozd. Reaktion of writer Jules Verne to this events and comments of the fransch press was later wroutes his romans ,,Mathias - Sandor " , where intentionally name, origin and adventurous escape of prisons one of emigrants. In 1849 Ladislav Vietorisz, the cousin of the Sandor de Szlavnicz family, was appointed as the government commissioner of the Trenčín County because of the interruption of the Hungarian state administration by the Austrian administration. Asyl politic emigrants to France of then Hungary However, it was not nothing new. In particular, emigrated to Paris more of hungarian nobility too in times fransch kingdom. Gladly take them directly to his family and gave them his daughters married for moustknowns franschs nobles familys. J.G.V. (* 8.february 1828, Nantes † 24.march 1905, Amiens), fransch writer, famous autor scienstic-fantastic no genre. His books likes hunredmilions young readers to the world, without distinction, all ras, social origin, nationality and religions have all generation. Newer could be so if it not raised parents it\'s modern, democratic, republican fransch spirit that permeates evrys sides of his romans. Childrens years Jules Verne to live in island Feydau in midle of river Loire. There also grew, hi plays with frends and survives in his adventure Travel. Father Pierre Verne, wealthy Parisian advocate wanted, after that it took advocates praxis. Mother Sophie Allote de la Fuye came of Normandy. His sisters was Anne, Mathilde and Marie. Painter, his onkel Châteaubourg, as an artist all the boys\' dreams and understand fully supported. Jules nearest with him have a relationship and often visited him with younger brother Paul. Onkel they seize with his beautiful drawings of many lands that he traveled and the Jules and Paul has not left the newer more of his fantasy. In 1839, the year Somer Jules tried escape of home, he hire as a lifeguard at xebec Coralia drift to India. Fortunately for the hundreds of millions of future yangs readers to his parents early detect and prevent him depart. Windily finis study law and was successful businesmann with aktions in exchange. In his youth wrout many poems, short stories, plays and songs. Married 10.january 1857 to widow with two children madame Honorine Anne Hébé du Fraysse de Viane Morel, born in the Vesoul, have with son Michel. Son after his dead, broken finis works. 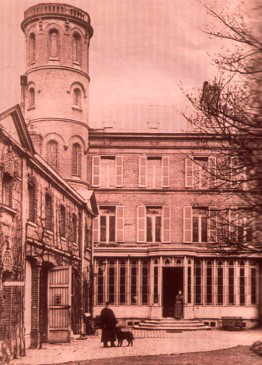 In the year 1862 is familiar with the Paris imprint Pierr Jules Hetzel, who gave his novel Five weeks in balon. He paid him 10 000 franks, the situation of high noise. Román was a great success because the publisher P.J.Hetzel with autors concluded with an exclusive contract for 20 years, in which the J. Verne order to write the Romans for two year for fees 20 000 franks. Treaty was financially secure and allow him live only with writing. Publisher Hetzel was for autors windily obliged provide him with extra income, societys success, because his fees are increased. Moremo with cheanched contract, so J. Verne may have to buy villa, yacht and Saint Michel presonaly finally take the road on which the World writed. 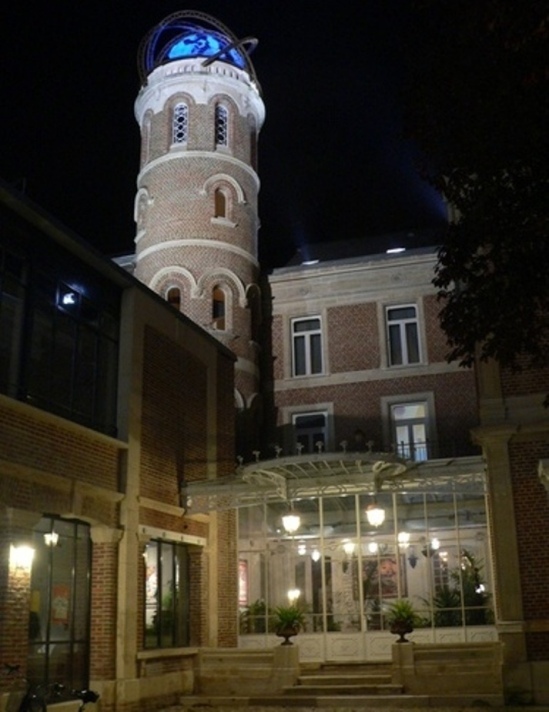 Jules Verne in Amiens Museum building recalls not only architecturally, but also their spirit of its numerous visitors. 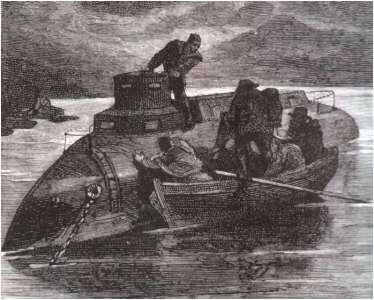 Jules Verne later traveled many, as if he wanted to confront his fantasy with reality. Visited North Africa, Baltic, USA, emperors russian, Osman Empire, Hungary, etc. Cove of Naples in the year 1844. 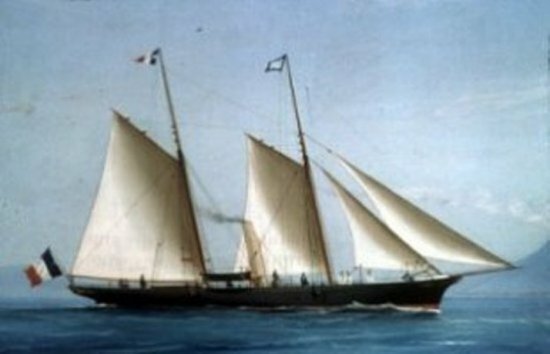 Painting steam yachts Saint Michel III, whose owner was Jules Verne. It cost him 55,000 francs before J. Verne had two owners. It was 31 m long, at its widest point 4.6 meters wide with a draft of 2.9 meters. In 1863 he founded the Imre Baron Ivánka de Draskócz et Jordánföld in Budapest, the first Danube Steamship company in Hungary, from 1878 to 1891 he was the General Director of the Southwest Railway Company in Hungary. Baron I. Ivánka founded the Hungarian Red Cross, which was the first administrator in the years 1881 - 1890. The Grand Master (1896) Imre Ivánka de Draskócz et Jordánföld, the founder of the Red Cross in Hungary, is a family member of the Ondrejkovic family through Esztera Ivanka de Draskócz et Jordánföld, the mother of Trenčín County Judge Stephan Sandor de Szlavnicza. For the benefit of the Red Cross and Rescue Service, for example, the granddaughter of Stephan Sandor de Szlavnicza Anna Ondrejkovičová worked for the District Notary Rudolf Mičura. In the treatment of the sick in Dlhé Pole and Turzovka, the typhus epidemic became infected and 1917 died. 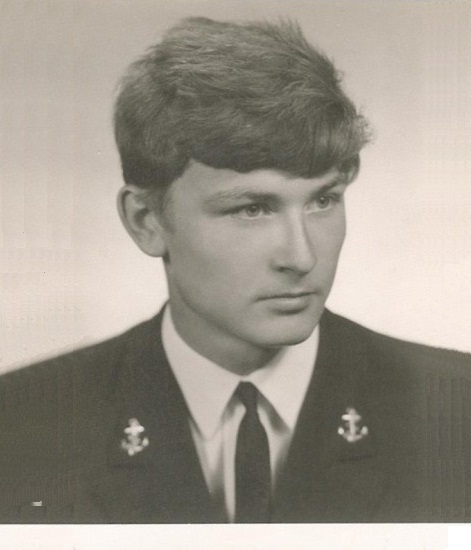 Pavel Ondrejkovič, the grandson of the administrator teacher Stephan II. Ondrejkovič and the praetor of Trencin County Judge Stephan baron Sandor de Szlavnicza in the year 1966 before joining the ZVS after returning by train from a non-floating craft ČSPD n.p. to the Danube Delta, Romania\'s Galati port. Notes: The document-sharing Tematín estate from 1687 are registered as users of the castle Gasparus IV (Gaspar, Caspar) Sandor de Szlavnicza (Kuruc envoy at the court of French King Louis XIV.) and his wife Ersze baroness Thököly. Gasparus IV Sandor was ambassador at the court of the Ottoman Sultan Mehmed IV who was also a supporter and ally Kuruc ; County Trencin Judge Stephanus Sandor de Szlavnicza, whose mother was Eszter Ivánka de Draskócz et Jordánföld was grandfather of administrator teacher Stephan II. Ondrejkovič, born in Dolné Držkovce. The District notary in the Dolné Držkovce Stephan I. Ondrejkovič, Catholic, son in law of County Judge Stephanus baron Sandor de Szlavnicza be like his ancestors in the year 1683 politically closer to the Austro-Slavism, as a student contributes Slovak Matica until its abolition in the 1875.